i just gosh-darn love playing: outdoors, laugh-y, partially strategic, partially flukey, no-athleticism needed FUN! alas...i'm sorely out of practice! off to the lawn to rediscover my prowess! 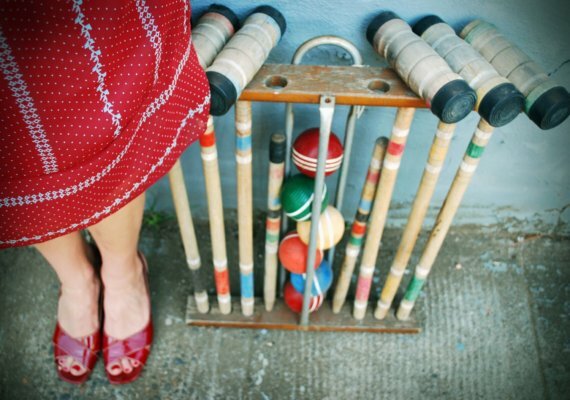 We play croquet every summer at my MIL's cottage! I never win, but it is fun. i actually usually never win, as well. but it's so fun that never seems to matter! fun, marta! i recommend just setting up the *wickets* and choosing your own rules! Croquet is such a fun and charming thing. My grandmother had a set we played with all the time! My hubby introduced us to the fun of croquet - he loves to be 'poison'!!! It is a great game. Enjoy! hοw can i subsсгibe for a weblog ωebsitе? The accοunt aіԁеd mе a applісable deаl.